Each piece of equipment in industrial production has a certain period of use. Because of the high production cost, it is necessary to maintain and maintain the equipment in a very fine manner in order to maintain the service life of the equipment for a long time. In order to extend the life of the device, people have come up with many methods. One of the methods is to use corrosion and scale inhibitors. This solvent can effectively reduce the chance of corrosion of the container. Let the inside of the container maintain a very new state for a long time. It also reduces scale formation. Dispose of the debris in the water quickly and rinse it off with the water. Avoid fouling on the inner wall. At present, the production technology of corrosion and scale inhibitors used by people has reached a very advanced level and has perfect technical support. The secrets and techniques of different manufacturers are different. The most advanced is the use of separation technology. This technique effectively combines and separates molecules. A very advanced spectral illumination instrument is used. This instrument is capable of emitting light in different wavelength bands. Nuclear magnetic reactions can also be produced. Analyze using the spectra they present. Produce a very comprehensive gallery. There is a staff member to record. This will be fully prepared for a large number of products in the future. Separation technology is very advanced technology. There are also many types of components contained in corrosion and scale inhibitors. For example, it contains organic phosphorus. There are also some very powerful additives that are all materials that help organic phosphorus work. 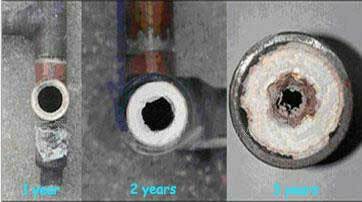 There are also corrosion inhibitors that reduce the rate at which copper is corroded. This water treatment agent is very effective for metals containing copper elements. Can be used to disperse the dirt inside, and then better dissolve in water and discharge. Chemical treatment of circulating cooling water not only stabilizes water quality but also improves production efficiency. 1. Reason: Various salts such as bicarbonate, carbonate, sulfate, and silicate are dissolved in natural water. When natural water enters the circulating water system as supplemental water, it is concentrated by evaporation and the ion concentration in the water increases. Especially bicarbonate. This salt is the main component of scale adhesion in cooling water. 2. Treatment measures: Add high-efficiency slow scale inhibitor to hinder and destroy the normal growth of inorganic salt crystals such as calcium carbonate and magnesium carbonate. Slows down the growth rate of the crystal. Thereby reducing the formation of salt scale. The scale inhibitor forms a water-soluble complex or a crab compound with Ca2+, Mg2+, etc., so that the solubility of the inorganic salt is increased, which acts as a scale inhibition effect and is not easily deposited on the metal surface. Second, corrosion and scale inhibitor. 1. Reason: The second major problem to be solved by circulating cooling water is the corrosion of metal equipment. The surface of the metal (carbon steel, stainless steel, copper, etc.) is in contact with water, and the water contains various impurities such as dissolved oxygen and CO2. The potential difference produces an electrochemical reaction. Thereby causing corrosion damage to the metal. Corrosion results in reduced equipment life and corrosion products forming fouling. Reduce heat transfer efficiency. Unexpected shutdown due to leakage of the heat exchanger. 2. Treatment measures: There are many ways to control the corrosion of the circulating water system. The addition of a water treatment chemical method is one of them. It is by adding and maintaining a certain amount of corrosion inhibitor to the circulating water. The corrosion and scale inhibitor provides a dense continuous metal oxide film or other types of film on the metal surface. In order to suppress the corrosion process, thereby achieving the purpose of corrosion. The corrosion and scale inhibitor can greatly reduce the corrosion rate of the equipment and greatly extend the life of the equipment. Experiments show that after the heat exchanger pipeline equipment is prevented by the corrosion inhibitor, the service life of the equipment is extended by about 40% on average. Third, sterilization and algae killing. 1. Reason: The open circulating water system has sufficient light, suitable temperature and abundant nutrient source to promote the growth of microorganisms. This leads to biological slime and corrosion, and the damage that microbes bring to the system is nothing more than dirt and corrosion. When expressed, it is often mixed with the dangers of scale and electrochemical corrosion. Microbial slime is composed of microbial cells and viscous substances (polysaccharides, proteins, etc.) that are bonded together. Open circulation cooling water system. The most common faults caused by slime-producing bacteria. The second is the problems and treatments of algae, mold (filamentous bacteria), and jersey bacteria (filamentous fine water system). 2. Treatment measures: For the circulating cooling water system, it can cooperate with the system to prevent scale and improve the corrosion inhibition effect. It is necessary to regularly add bactericidal algaecide for treatment. For this circulatory system, oxidizing and non-oxidizing bactericides are used alternately. It can prevent the resistance of bacteria to algae. Improve the sterilization effect. Over-casting and slime stripping agent allows slime composed of slime, sludge, algae secretions, and algae to be discharged with water to achieve strong peeling and cleaning so that the surface is clean and prevent corrosion under scale. In summary, it can be fully understood that the scale inhibitor plays an important role insufficient, corrosion inhibition, sterilization, and algae elimination in the circulating cooling water treatment system.